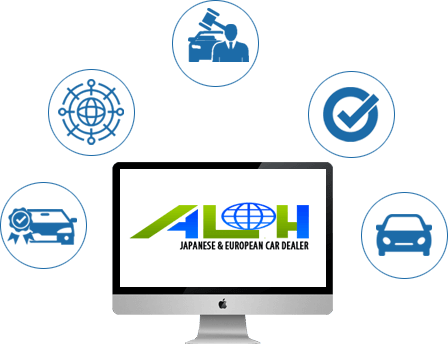 Among thousands of used car exporters in Japan why you should select Auto Link Holdings LLC ? Auto Link Holdings LLC is a certified company by Japanese government organizations such as Chamber of commerce, Japan External Trade Organization (JETRO)& Kanagawa Public safety commission. We are proud to announce that the Auto Link Holdings LLC has registered agents in New Zealand ,Korea, Trinidad & Tobago,Guyana,Tanzania ,Kenya & Sri Lanka.Other than that we have regular customers from all over the world which we can assist you in any time for purchasing when you are a new to Auto Link Holdings LLC. Auto Link Holdings LLC has vast used car and machinery dealer network in Japan as well as satellite access to all major used car auctions in Japan.This will help our clients to get their vehicles ,machineries, construction equipments even boats or farm tractors for the reasonable prices in a short period of time. We are a company operate business in Japan since 2005 exporting Japanese & European vehicles to over 30 countries in the world. Gradually we have developped our company reputation and trustworthiness with our clients beause of this we have supported by major banks in Japan as well as we have increased our capital to 50 million Japanese yen. Japanese used vehicles are renowned throughout the world for high quality. Cars in Japan are subject to strict emissions standards that encourage the sale of used cars sooner than in most countries. The Japanese used car is peerless on price, quality and cleanliness.